I sat down and pour myself a tiny glass of vino di visciole, a sweet wine made with sour cherries, a bottle left from a past weekend. The memories of those two days spent with some friends will be indelible just like the red cherry stains on my lips. We chose a weekend that was a bridge between August, the month of empty cities, Italian holidays and silent streets, and September, the time of the big coming back, of the scent of must, of new notebooks and rediscovered routines. The light after the sudden storm that put an end to the August heatwave was already distinctly different. I could read there a nostalgia that perfectly reflected what I was feeling inside. Although I had longed for this change of temperatures and for the triumphal entry of September and its new colours with trepidation, I am torn. I am suspended between the obvious satisfaction of inhaling the smell of rain when I open up the kitchen windows in the morning and the awareness that another summer is coming to an end, with its store of good intentions and its lists of things to do and to change still to tick off. I am already working on autumnal recipes based on pumpkin and porcini mushrooms, those of Christmas are just around the corner. I’m buying books on cooking techniques and food writing, I’m downloading interesting lessons and podcasts to start studying again as soon as the season gets cooler and the time of cooking classes drifts towards the low season. I clearly perceive that fruitful excitement that marks the first days of school. I found myself thinking with a pang of nostalgia about the evenings when we ate out with a concert of crickets, cicadas and frogs as a background, about the pheasants singing far in the fields when the light goes down, about the acqugym lessons in the outdoor pool that made me feel on holiday even without leaving for distant destinations, about the spots of colour of tomatoes among the leafy and shady vines, about the freedom with which I tied my hair for months to fight the heat. Even though I had little time for myself and I managed to accomplish just a tenth of everything I had planned, even though my diet proceeded steadily but too slowly and my reading aims broke on a soft pillow and a fresh bed, I leave reluctantly a season that gave me a light heart and a subtle tan, a memory of a few days spent in Maremma in a June that seems already so far away and so long ago. In these days, years ago, I would have sharpened my pencils and put them on a chromatic scale, inebriated by the good smell of wood and colour. Today I do the same with flours, legumes and dried fruit, I stock up the pantry to start again, even though, after all, I never stopped. This nostalgia that lingers at the mouth of my stomach speaks of new beginnings and summer remnants, of sunshine hours first carefully avoided and now savoured with pleasure, as with the last juicy peaches of the season. You try to impress their taste on your tongue as not to forget it when apples, pears and citrus fruits will invade the market benches. The sense of here and now sharpens up, as you can not give the summer here and now for granted anymore. The eggplants, which I have grilled for months, their smoky scent a constant presence in every dinner in the garden, now become something to cherish and enjoy, as you can see the end of their season on the horizon. Though here it comes again, the desire to cook something more structured, to turn on the oven, to mop a rich sauce with a piece of bread. So I cook meatballs with tomato sauce, with roasted eggplants inside. I’ve become a fan of meatballs in the last years, growing up in a house where mum used to make instead a tasty and dense meatloaf, deliciously browned and served with a thick sauce. So I came up with its mini version just when I started to cook for two, for me and Tommaso. According to the season, you can substitute roasted eggplants with boiled potatoes, roasted butternut squash or breadcrumbs soaked in milk. I usually choose between grated Parmigiano Reggiano, aged Pecorino or Provolone to add flavour to the meat, sometimes adding brined capers, too. This time I opted for Parmigiano, along with a pinch of dry oregano to give a mediterranean touch. Garlic is essential in meatballs. Instead of adding it raw and finely chopped to the ground meat, I caramelized the garlic cloves in the oven along with the eggplants: it is more delicate and marries beautifully the smoky taste of roasted eggplants. Last thing I have to say, these meatballs demand to be eaten with bread, as it would be a serious sin not to mop the sauce in your plate. 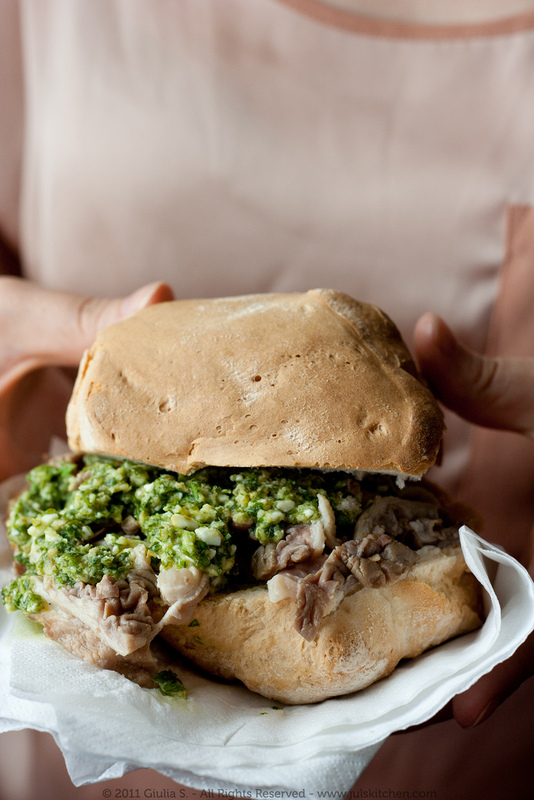 If you have leftovers, why don’t you sandwich them in between two slice of bread for your lunch break? Heat the oven to 200°C. Rinse the eggplant and cut it in a half lengthwise. Place it on a baking tray cut side up and score the flesh in a dimando pattern. Brush with olive oil and a tablespoon of water. Sprinkle with salt and add the garlic cloves, without peeling it. Roast for about 50 minutes or until the eggplant is golden and so soft that it can be easily emptied with a spoon. Collect the eggplant flesh in a bowl. Add the garlic pulp, squeezing it out from the peel. Now add the ground beef, the dried oregano, the breadcrumbs and the grated Parmigiano. Season with salt, then add a slightly beaten egg and mix the ingredients thoroughly with your hands to get a homogeneous and dense mixture. Make now 12 meatballs, shaping them with wet hands or with an ice-cream scooper: I found out that it is the quickest and cleanest way to have meatballs all of the same size. Coat the meatballs in breadcrumbs, then place them on a baking tray and drizzle with olive oil. Check that your oven is still at 200°C and bake them for about 20 minutes or until golden. In the meantime, prepare the tomato sauce: in a pan large enough to contain all the meatballs pour two tablespoons of olive oil, then add the garlic, some basil leaves and the tomato purée. Cook for about 10 minutes on low heat. When the meatballs are ready, remove them from the oven and add them into the pan to cook for the last 5 minutes, so that they can absorb the sauce and gain a deeper and sweeter taste. You can serve them immediately or set aside and warm them up just before bringing them to the table. Inspired by this article in celery, yes, on celery, one of the most underrated vegetables in our cuisine, I’ve written a newsletter to share a salad recipe made with walnuts and Parmigiano, which will help you to use those almost forgotten celery stalks that hide in your fridge. Here you can read the newsletter, while here you can subscribe to receive the next ones. A few recipes for meatballs that you can find here on the blog: cheek and tongue meatballs with mustard glazed carrots, cooked ham meatballs, polpette di prosciutto cotto, millet croquettes with carrots and black olives. Rachel Roddy’s very best recipe for meatballs, on the Guardian. These meatballs are different, do not to fry or seal, but simply poach them in a rich, soft tomato sauce. 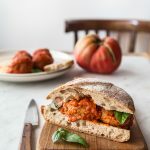 I also love this post written by Emiko, Meatballs and a love story, with a recipe for Nonna Anna’s meatballs. Valeria has a recipe for meatballs in her new cookbook, Veneto, and you can read it here. A last question arises, when thinking about meatballs. Is Spaghetti and Meatballs Italian? You can read more about this in the Smithsonian article. This is such a wonderful recipe…all the goodness of simple ingredients. Makes me want to go right now and cook them up! Grazie mille! Love your post! Can’t wait to try this recipe! The pictures are beautiful! Ah Giulia meatballs that include eggplant?? I am in heaven as I love both. Will give these a try soon. And I agree, meatballs and sauce belong on bread or in a roll. Ah Giulia, meatballs and eggplant? I am in heaven since I love both. 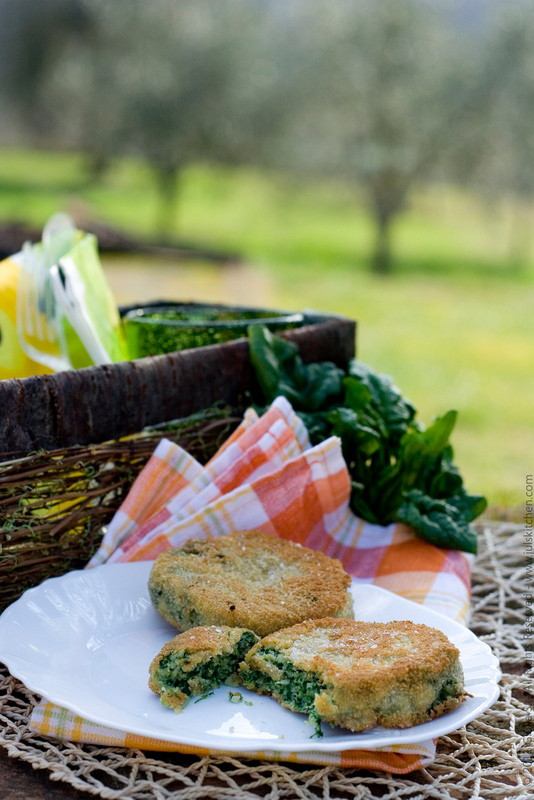 I will try these very soon, the recipe sound delicious and simple. And I agree, meatballs and sauce belong on bread or in a roll. Cooked them this weekend and loved them. Buonissimo! Oh man, these aubergine meatballs looks fantastic! So good! I’ve made them 3-4 times in past month to use up some of my sister’s bountiful eggplant crop, and she’s hooked on them too. Greatest thing is it’s a good way to slip some veggies to a meatball-loving toddler like my grandson. Just made a double batch (without sauce) to have in the freezer for his next visit. Only recommendation is to only roast the garlic for the last 20 minutes. good tip about the garlic! and so so so happy you all liked them! These are brilliant! I made them this evening, and they are gorgeous: meaty, yet light because of the loft that the eggplant gives. I used a very lean mix of ground beef, and they still turned out beautiful, moist, and tender. I would imagine that using the eggplant also makes them a bit more diet-friendly, adding some fiber and sneaking in that extra serving of vegetables. I used them as a secondo, after starting with Juls’ pasta with broccoli (which is also a fantastic, easy recipe and a great way to add more veggies)! Hi, I recently found your website through the Saveur website. Congratulations on your nomination. You have a lot of wonderful photographs and interesting recipes. I can’t wait to try some of them. For this eggplant meatball recipe I was wondering how much eggplant to use. I grew a lot of small globe eggplants this year. If I only used one I don’t think it would be noticed. How much by weight as compared to the 360g of ground beef? hello Terry, thank you so much! I’d say same weight at least! previous post: Pasta with tomato sauce, guanciale and olives + A Saveur nomination!